Whether you’re a home collector or museum curator, you know the challenges that come with storing artwork and framed paintings in particular. Keeping them hung on the wall is ideal, but there are times when you have to store paintings or safely transport them to another location. 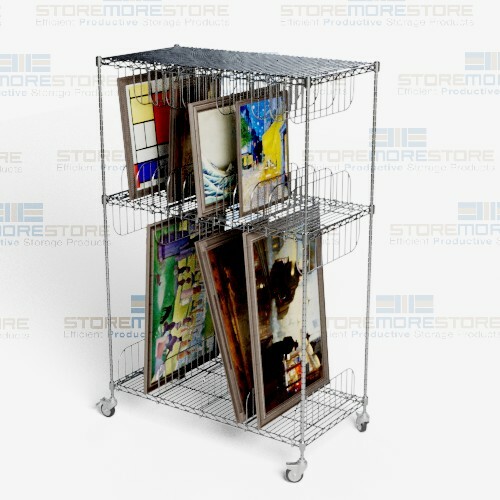 Framed artwork storage carts on wheels are a simple and effective solution that keep your valuable collections protected, clean, and organized in less space than traditional shelving. Because they are designed for painting storage, the cart’s commercial-grade chrome wire is durable and long-lasting. Adjustable shelves and dividers allow you to adjust its configuration to your needs. This means you can store multiple sizes of paintings in one cart to save space and organize. Since paintings have unique storage needs to promote preservation, the wire shelves are National Sanitation Foundation (NSF) approved. The wire construction also allows air circulation and prevents the accumulation of dust and dirt, which can cause extensive damage. Wire also allows light to pass through the shelves, which provides better visibility so users don’t have to remove the paintings to identify them. Lastly, the dividers keep paintings separated so they don’t lean against each other during storage or transport. 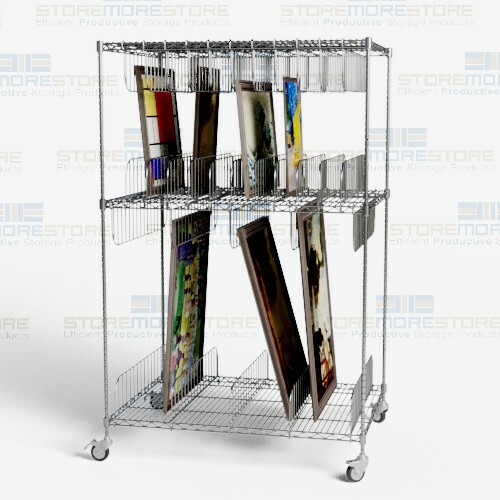 Framed artwork storage carts are available to buy online and ship within 5-10 days with free dock-to-dock shipping. If you need any assistance or just want some help picking the right solution for you, please call us at 1-855-786-7667.